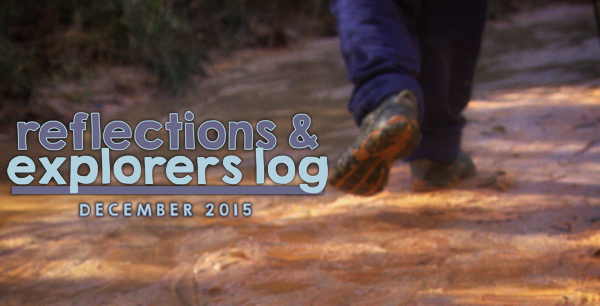 Well, I’m finally getting around to my last Reflections & Explorers Log for 2015. I learned a lot in 2015, and heading into 2016 with a new perspective. I’m closing the door on the most painful, challenging years of my life. We mucked through these shallow channels to view the marvelous colors and rock and formations of Providence Canyon. These trickling waters continue to carve this canyon, and I feel a connection between this erosion and my life over the past few years. After my husband died (I know I mention it a lot. That’s because it’s a big deal. ), I underwent some erosion and a huge canyon was carved in me. I do miss what used to be there – however, what has been revealed is magnificent.